The U.S. Border Patrol seized more than $3 million in cash that it says two men were trying to smuggle into Mexico from California this week. Border Patrol agents in California hit a jackpot this week in terms of cash seizures: $3 million. For the agency that deals with border security, it was a major intercept of smuggled cash. The Border Patrol noted most of its past seizures have been in smaller amounts: $300,000, $51,000 and $43,000. "This is one of our larger cash seizures," said Ralph DeSio, spokesman for the San Diego office of US Customs and Border Protection. Normally, he said, the big figure reported is the value of confiscated drugs. Currency smuggling and money laundering are the lifeblood for the Mexican cartels moving the majority of heroin, cocaine and methamphetamine across the US border as well as for human traffickers. If the sophisticated gangs can't get their tens of millions of dollars in cash home each year, the US market wouldn't be nearly as attractive. And California is central to those type of activities, experts say. Los Angeles is known as the nation's "epicenter" for money laundering by international drug cartels, federal officials said in 2014, after raiding businesses and seizing an estimated $100 million in cash and from bank accounts around the world. San Diego is a major hub for actually trafficking the proceeds from illicit activities, DeSio said. The money was found in a Volkswagen Passat, he said, a car not as likely to attract attention. The $3 million, however, pales in comparison to seizures elsewhere, such as the $24 million seized in June by Miami-Dade Police in Florida. 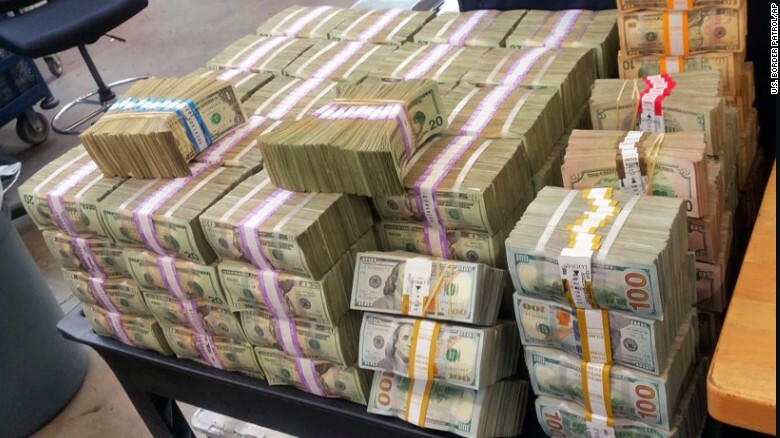 Officers seized $23 million in cash in 2011 during Operation Four Horsemen in metro Atlanta, a major trafficking hub for drugs coming to the East Coast and cash deliveries back to Mexico. The Mexican cartels use tractor-trailers to deliver the cash from Atlanta stash houses to the cartel safes in Mexico, said Rodney Benson, who was head of the Drug Enforcement Administration office in Atlanta at the time of the seizure. The San Diego Border Patrol agents made a dent in the cash flow Tuesday when they arrested two men in Escondido, just north of San Diego and about 40 miles from the Mexican border. An agent pulled over a Kia Forte and found nearly $34,000 stashed in the console, the agency said. A 53-year-old American was arrested. Other agents were able to locate a Volkswagen Passat suspected of having driven in tandem with the Kia, the agency said. They arrested the driver, a 41-year-old Mexican national, for suspicion of currency smuggling. The trunk of the Passat is where they then recovered $3,018,000, the agency said. The Border Patrol turned over the two suspects to Homeland Security, and they now face federal charges for currency smuggling.